- 100% cotton sheared terry. - Sewn with cotton thread. 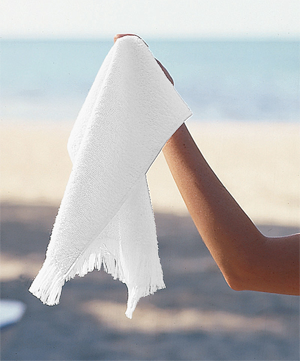 Anvil Towels Plus® by Anvil 11" x 18" Fringed Spirit Towel. 100% cotton sheared terry. 1.0 lb. per dozen. Fringed ends. Sewn with cotton thread. Oeko-Tex® Standard 100 Certified (all colors certified). Woven label. 11" x 18". Colors: White, Black, Gold, Navy, Purple, Spirit Red.